↑ 1.0 1.1 Steve Jackson. "Honey Badger..." สืบค้นเมื่อ 6 July 2011. ↑ Don E. Wilson & DeeAnn M. Reeder (2005). Mammal Species of the World. A Taxonomic and Geographic Reference (3rd ed). Johns Hopkins University Press. ISBN 978-0-8018-8221-0. ↑ Dragoo and Honeycutt; Honeycutt, Rodney L (1997). "Systematics of Mustelid-like Carnvores". Journal of Mammalogy. Journal of Mammalogy, Vol. 78, No. 2. 78 (2): 426–443. doi:10.2307/1382896. JSTOR 1382896. ↑ Heptner, V. G.; Sludskii, A. A. (2002). Mammals of the Soviet Union. Vol. II, part 1b, Carnivores (Mustelidae). Washington, D.C.: Smithsonian Institution Libraries and National Science Foundation. ISBN 90-04-08876-8. 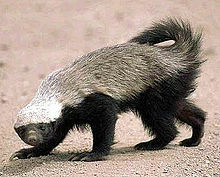 ↑ "Honey badger videos, photos and facts - Mellivora capensis". ARKive. Retrieved 2012-11-27. ↑ Rosevear, Donovan Reginald (1974). The Carnivores of West Africa. London: British Museum (Natural History). ISBN 978-0-565-00723-2. หน้านี้แก้ไขล่าสุดเมื่อวันที่ 9 เมษายน 2559 เวลา 19:41 น.